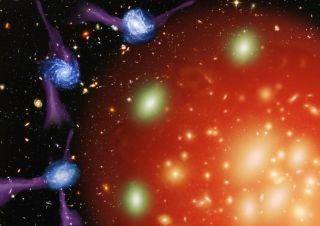 This artist's impression shows one potential "strangulation" method for galaxies in which star-forming galaxies accrete into a giant, hot halo which then leads to the death of those galaxies. The researchers said the strangulation theory accounts for galaxies up to 100 billion times heavier than the sun, which make up more than 95 percent of all galaxies. For larger galaxies, the evidence was not conclusive for either the strangulation or sudden-removal theories, Peng said.